My mother knew how to do voodoo. Billye Faye Vanderslice Watson wanted my brother and me to go to Baylor University from the time we were pretty young. I remember her mentioning Baylor to me—seeding it in my hand—as early as the 6th grade. I’d never heard of that place. I started high school debate as a freshman and, every summer, I went to the Baylor debate camps and lived in the dorms. By this time, we’d all uniformly concluded that my singular life skill was talking a bunch. So we asked lawyers about where an opinionated, loquacious, smart-aleck young man should go to law school if he wanted to end up in the courtroom—as a lawyer, not as a defendant. The consistent answer was Baylor Law School. So there was really only one choice when it came time to apply to a college. Same for Kyle, my brother. Billye Faye’s motherly magic and life management made the whole thing happen. There’s no question in my mind. I think she’d have been proud this past Saturday night. The Baylor Line Foundation, which is what Baylor people call the alumni association, gave me a Distinguished Alumni Award. It was a neat deal. And I’m very honored. It’s really something special to have people who support an institution that’s been a part of your life — for really all of your life — say that they’re proud of you and that you’ve brought distinction to a school they love. 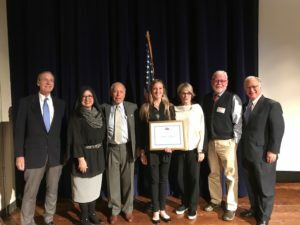 Natalie Fontenot, a U.S. history teacher at Reagan Early College High School in Austin ISD, received a pretty great honor as well. Humanities Texas gave her the 2017 Award for Outstanding Early-Career Teaching. She’s a wonderful example of the smart and dedicated public school teachers that serve and support the children of Texas every day, and I was pleased to be there for the recognition last week. That’s a good history lesson we all should learn.